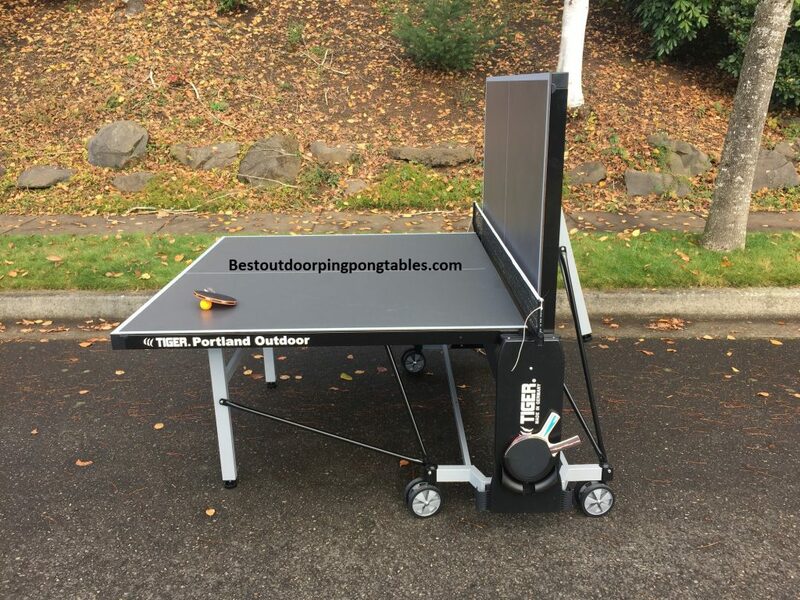 Tiger PingPong is a company based in Vancouver, BC (Canada) that is starting to distribute their tables to the United States. I was fortunate enough to get ahold of the Tiger PingPong Portland Outdoor table and do a complete review of it. The table retails for $1080 and is very similar to the Cornilleau 400M in terms of construction and materials. The tabletop surface is 6mm thick made with Melamine resin board. It’s totally weatherproof and water resistant. The Portland Outdoor ping pong table comes in 3 color options (green/blue/gray). We went with the gray option since it looks great outdoors. You can see our video review to the right and all the photos we took below. 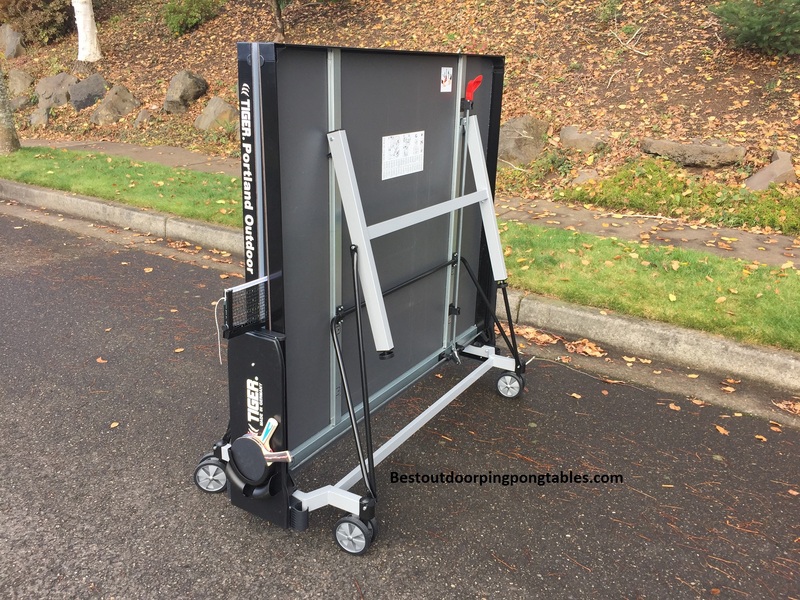 At around 165 pounds, the ping pong table is very sturdy and should be durable enough to last outdoors here in the Pacific Northwest. By the way, we do our product reviews in Portland, Oregon, so it’s only fitting the table is named after the city here in Oregon. We feel privileged to have the opportunity to give our feedback on the table below. Frame/Design – The frame profile (apron) is 50mm and powder coated. This profile helps support the 6mm thick tabletop. The frame for the undercarriage has square legs that are 50x30mm and also powder coated so they will last outdoors for years. The legs feature levelers (see photo below) and you can adjust the standing position up to 30mm. We used the levelers the first day we had it in our test garage since the floor is sloped and we were able to get a level playing surface quite easily. 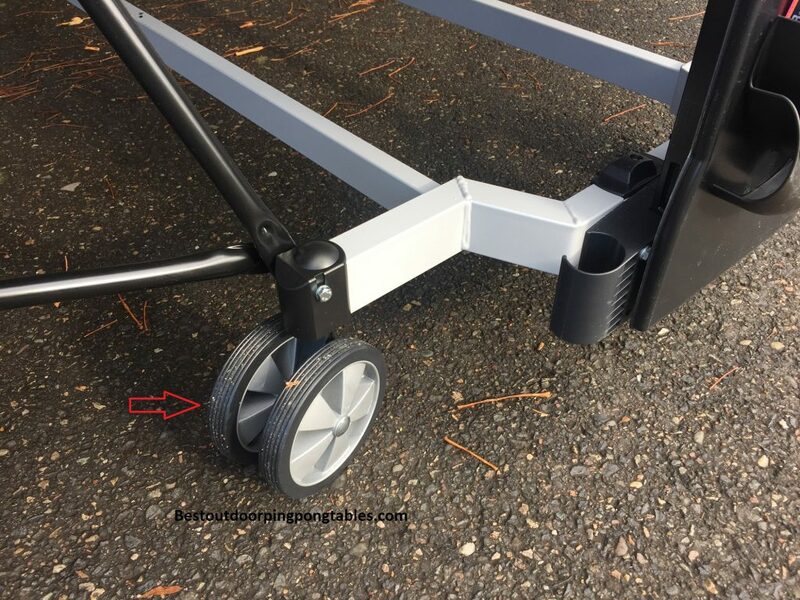 The 4 double wheels are perfect for moving the table around on concrete, rocks, tile, decks, etc. The wheels are 128mm with rubber tread and very maneuverable. The only drawback is that they don’t have a locking mechanism. Most other models in this price range offer that. Playability – We always find that outdoor tables have a slightly different bounce than indoor models. It’s just the nature of the business. The outdoor tabletops are made with different materials so that they will last outdoors in rain, sun, snow, frost, etc. The melamine resin board plays pretty well. We took the table out to the street and let locals play on it for a while and got their feedback. We found the top to play ‘fast’ and the bounce was more than adequate. A few people who used it thought it was an indoor table and didn’t even realize they were playing on a true outdoor table. So, Tiger PingPong has done a wonderful job with this table. The table is easy to get into playback mode if you need to practice your shots when no one else is available to play with. The net system is easy to adjust for both height and tension. Playability matches that of the Cornilleau 400M. Assembly – Putting the table together is not overly difficult, but it will take a while. I was fortunate enough to have their staff member (Shawn) come down from Vancouver and help me with the assembly process. He was there when the table was delivered off the truck and he showed me how to take it from the box and get organized with the parts. Don’t get overwhelmed with it, basic tools are required to do the assembly. If you can put together furniture from Ikea you can do this. Shawn was able to put it together in an hour. There is a video (see it to the right) that shows you step by step instructions if you get stuck along the way. Cornilleau tables take about an hour to assemble and Killerspin tables are the fastest at 20 minutes. Killerspin uses a 2 piece table design that makes assembly much easier on their models. Safety/Locking System – The system is very similar to that of Cornilleau. 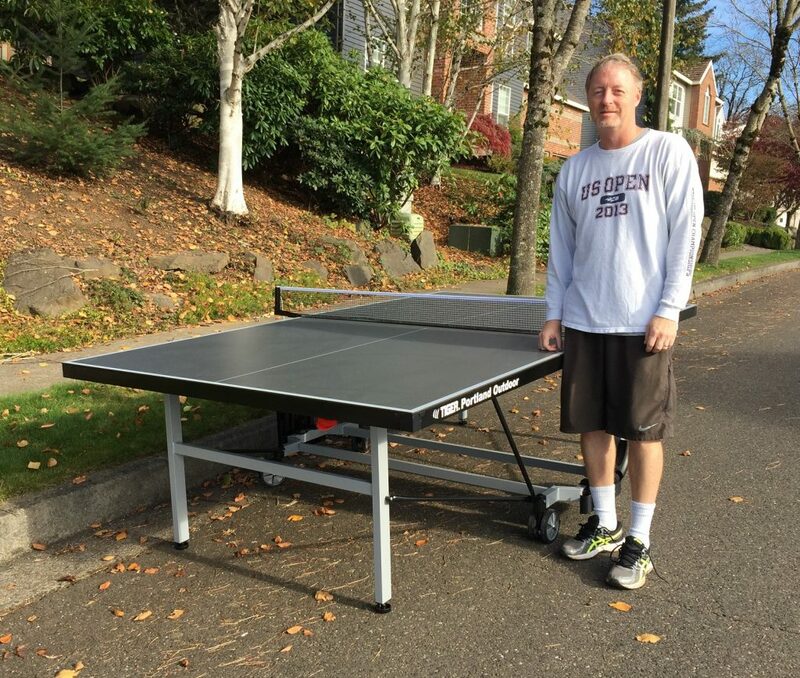 The SMS (Smart Manual System) on the Portland Outdoor ping pong table is easy to work with and very safe. The red handle is clearly visible from all sides of the table and in any position. Just pull up on the handle and the table will fold up or down with ease. The drawbar underneath unlocks both of the safety devices at the same time. If there is a forced opening, the safety elements will break and actually protect the drawbars. My 11 year old son was able to open and close the table on his own. I trust the safety locking system on the table. My only wish is that the red handle wasn’t made out of plastic. It might take a little abuse over time and I’m hoping it doesn’t crack or break off. Cornilleau does offer a 16 point locking system on their 400M and 500M tables, which is superior. You will have to pay a premium on those outdoor tables though. Advantages – Their price is very competitive with other tables that feature similar thickness tabletops. Customer service at Tiger PingPong is excellent. If you have any problems, they are quick to act on things. We like the ease of moving the table around with the wheel system and opening and closing the table is simple with one hand. The tabletop has above average bounce for an outdoor table too. Disadvantages – The lack of a wheel lock isn’t the end of the world, but it would be nice on future models. We wish the assembly were a bit easier, you are probably looking at 2 hours if you do it by yourself. The brand itself is new to the United States, so there isn’t a lot of history of how the tables will hold up over 5, 10, 15 years. Although we would say they look like they are designed quite well based on our initial review. 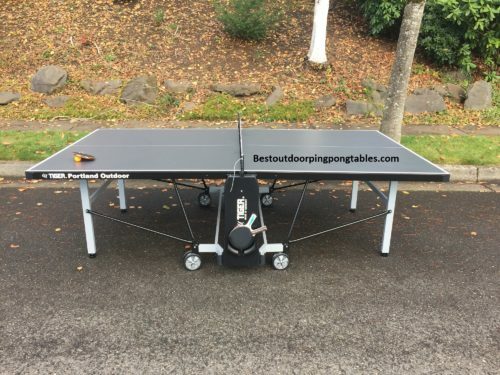 We look forward to trying the other tables offered by Tiger PingPong when they are released.